Like the real known universe, the Lego universe just keeps on expanding. 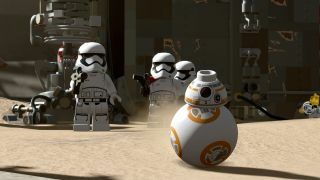 Today, TT Games unveiled the first gameplay video for the fifth entry in its Lego Star Wars Saga, Lego Star Wars: The Force Awakens. The trailer shows off a few new gameplay modes – space combat and first-person shooter mode – that will break up the series' standard gameplay of running around wreaking havoc. And while the two new modes piqued our interest, it's actually the promise to include new information about Poe Dameron and Lor San Tekka (the faux-Jedi dude killed by Kylo Ren at the beginning of the film) that really has us keen to play the game at E3 2016. In lieu of real LucasArts games, the Lego Star Wars games, with their quirky sense of humor and accessible gameplay, have filled the void where titles like Star Wars Rogue Squadron 4, Knights of the Old Republic 3 and Star Wars 1313 should've been. You can watch the trailer for yourself below and laugh (and cry when you see Han Solo) at the blocky caricatures of Poe, Finn, Chewie and Rey.